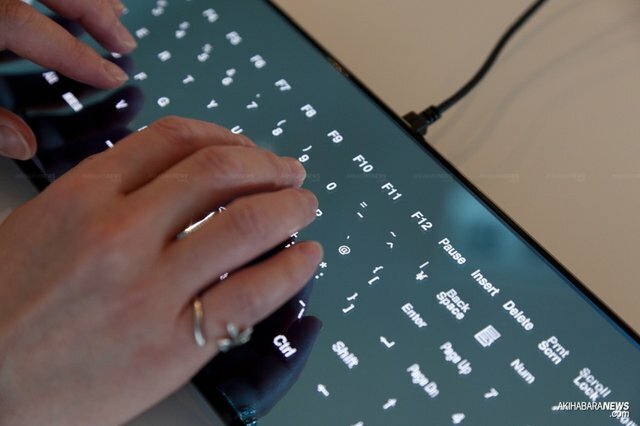 If you like typing on a touch screen, you’re going to love this thin Minebea Cool Leaf Keyboard. Strangely enough, even though the keyboard itself is one large touch screen, it doesn’t bring any of the versatility could offer. For instance, imagine substituting a video window for the number pad, or designing your own keyboard layouts for specific tasks, or even displaying tool palettes for Photoshop. Let’s hope Minebea explores that kind of versatility with this keyboard that already possesses multitouch capability. If you’re touch typist, the inability to feel the keys might be a dealbreaker, but if you’re a germ freak, this flat and shiny keyboard will be a whole lot easier to keep clean. It must be a fingerprint magnet, as evidenced by its shiny nature and included cleaning cloth. To be released first in Japan on May 13, it’s a USB keyboard with 108 keys that only works with Windows thus far. Minebea reps say a Mac version will be available soon, and the Japanese version will be rolling out first, followed by those that contain the correct character set and key layout for English, German, French and Italian. When you turn the keyboard off, its surface is reflective enough to be used as a mirror, perfect for looking yourself in the face and asking yourself this question: Why did I just spend $245 on this keyboard?